Why will train fares go up next January? 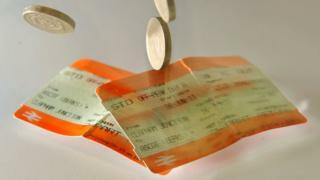 Millions of rail passengers will have to pay up to 3.6% more for their train tickets from next January, following the release of the latest inflation figures. The current version of the fares system lets so-called regulated fares rise by the annual rate of inflation, as measured each July by the Retail Prices Index (RPI). About 45% of fares in England, Scotland and Wales are regulated. Broadly speaking they are season tickets, some off-peak returns, some standard returns, and commuter fares into and out of the London area. So lots of fares are not regulated at all? Yes. About 55% in fact. These include all first class tickets, all advance purchase ones, and some off-peak fares. For these, the train operating companies can decide their own increases, which can be more or less than the regulated ones. When does the next increase start? The government must agree to the rise being implemented. It will not come in automatically. But assuming the government gives its blessing, the increases will affect fares from 1 January next year. The train companies do not in fact have to implement the increase if they do not want to. It is a ceiling. But obviously the chances are they will go the whole hog. Is the policy the same across the whole of the UK? Not quite. In Wales rail fare increases are also capped at July's RPI figure. But in Scotland the maximum increase affects some regulated peak fares, including Anytime and Season tickets. However, regulated off-peak fare increases are set at 1% below RPI. Why does the system link fares increases to RPI? The train companies say that some of their most important costs go up each year in the same way. These include the track access charges, which they must pay to Network Rail for the right to run trains on its rails, and to use its stations and signals. Also, under the various franchise agreements which govern the economics of each train operating company, payments they make to the government are also linked each year to the RPI. But why do fares have to rise at all? Regulation of some fares has existed since the old British Rail was privatised and split up into many separate companies in the mid-1990s. The point of regulation was to stop the new regional rail franchises abusing their near monopolies to overcharge their passengers. However, since 2007 it has been explicit government policy for passengers to pay more of the overall cost of running the country's rail system, and for taxpayers as a whole to pay less via subsidies. The coalition government continued the policy of shifting the financial burden to the wallets of passengers, though with less aggressive price increases than before. A research paper, published earlier this year by the House of Commons Library, cited earlier figures from the rail regulator in March 2016 showing that "passengers have contributed an increasing proportion of the rail industry's income relative to taxpayers over the past four years - up from 55.6% in 2010-11 to 65% in 2014-15." Is there a detailed, route-by-route, list of which fares will rise? No, according to the rail industry trade body the Rail Delivery Group. But any fare increases which are implemented should be made public by individual train operating companies this November or December. With just over half of fares being unregulated, will average fares soar away? According to the annual analysis published by the Office of Rail and Road (ORR), in January this year average fares across the rail system - regulated and unregulated - rose by only 1.2%. It was "the second year in succession when fares have risen below inflation," said the ORR. How come? Because train firms in fact chose to keep the lid on unregulated ticket increases, limiting them to just 0.8%. And even the regulated rises averaged just 1.8%, slightly below the cap of 1.9% set by the July 2016 RPI figure. Has inflation killed off an interest rate rise?